A breeze to set up and take down and easy to carry around, a canopy tent offers a convenient shelter you can put up instantly whenever and wherever you need a shady space outdoors. Given its user-friendliness, versatility, portability, elegance, and affordability, the best pop up canopy is an excellent investment. 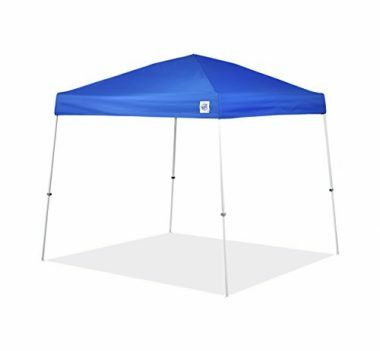 Whether you’re having a picnic at the beach, backyard barbecue, deck hangout, wedding, camping trip, festival, yard sale, tradeshow, tailgate party, a sports event, or a family get together, the protection from the elements, comfort, and elegance a shade canopy provides will make your outdoor event even better. So what is the best pop up canopy to buy? Here, we’ve compiled our top ten picks of the best instant canopies. Be sure to go through our buying guide section for advice on how to choose the perfect canopy for your needs. To start with, below are our top picks reviewed. Top on our list is this top rated canopy tent by ABCCANOPY. It is hard to find a better canopy on the market at its price level. It is a high-quality heavy duty pop up canopy that offers excellent protection from the elements and is built to have you covered for years. All you have to do is pick your favorite color and you will have a reliable and attractive instant shelter you can put up for festivals, trade shows, flea market, outdoor parties, backyard get-togethers, beach picnics etc. The canopy fabric is a strong silver coated 400 Denier polyester that is waterproof and offers 50+ UPF sun protection. The steel frames are very sturdy and together with the straight leg design, velcro attachment, and center support give the tent commercial-grade strength even in windy situations. Putting it up is super easy for two people and even one person can manage. Take down is also a breeze. Its tough construction makes it heavy but it comes with a wheeled roller bag that makes carrying it easy. Sitting Room: 4-6 people/4 tables/3 beach chairs/10 people for commercial events. Will you be setting up your canopy where bugs are buzzing? 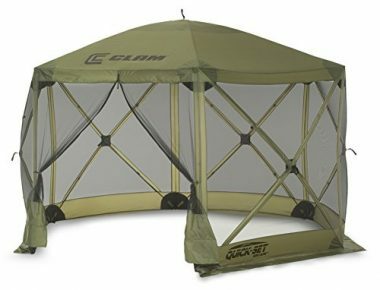 Then this screened shelter by Coleman is the best canopy tent for you. It is a great picnic, backyard, deck, beach, park, and camping canopy. The mesh screened sides are very effective at keeping bugs such as mosquitoes, moths, and bees out ensuring you have a great time outdoors. The canopy also offers 50+ UPF protection against the sun's harmful UV rays. The shelter also offers some shade and protection against light rain. 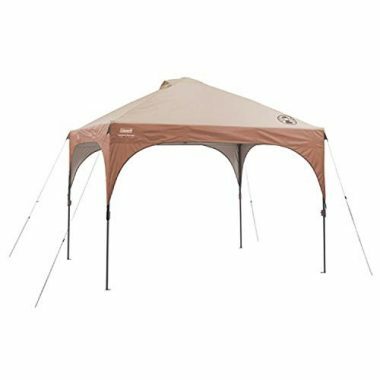 Coming from Coleman, the most popular canopy brand, this is a high-quality tent built to withstand the rigors of outdoor use. The canopy fabric is rugged and durable. The tent is strong enough to stay intact even without stakes on a breezy day. The tent also comes with stakes and guy lines for added stability on windy days. Entry is through two zippered doors. The simple three-step setup process takes less than five minutes even when alone. Taking it down is also very easy and it fits into the included wheeled bag easily. The carry case fits in most vehicles. The pop up functionality on this instant canopy by Crown Shades is very well thought out making the canopy very easy to erect even when you don't have another pair of hands to help you. All you have to do is open the frame, push the central hub system up and lift the top canopy. The height is easily adjustable using push buttons at the legs. It is a high quality and sturdy shelter. 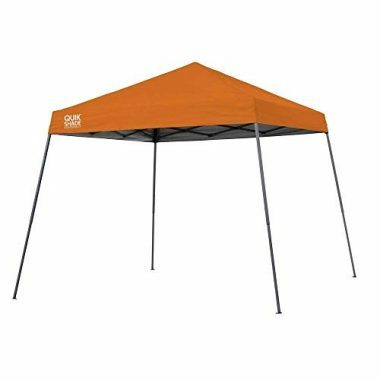 The 150D oxford canopy material holds up well against rain and wind, is water resistant and offers UPF 50+ UV sun protection. The sturdy steel frame is durable and powder coated to resist rust and corrosion. The straight leg design adds to the canopy's stability. 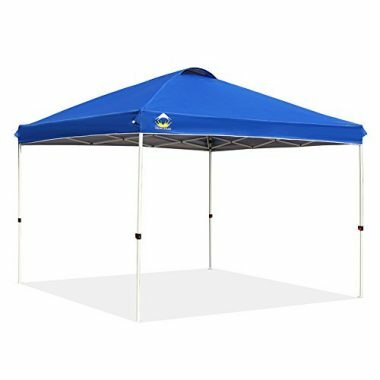 This professional-style canopy is great for businesses and craft shows as well as for fun activities such as tailgate parties, picnics, camping, backyard shelter, sporting events, and more. The carrying bag with roller wheels and rubber handle make its storage and transport easy. 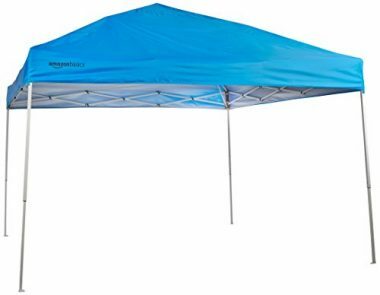 This attractive and budget-friendly pop up canopy by AmazonBasics is great as a starter, occasional or light duty use canopy for craft fairs, festivals, tailgating parties and other commercial and recreational outdoor events where the weather is calm. The tent inside is breezy and the canopy top provides great cooling shade and blocks 99% of the sun's harmful UV rays. It also resists water penetration, dries quickly and has a pointed profile that prevents water pooling at the top. For the budget conscious price, its quality is pretty good. The frame and canopy are solid and sturdy. The canopy is thick, durable and securely attached via velcro. The powder-coated steel frame resists chipping, peeling, corrosion and rust. The cathedral style roof offers maximum headroom and the height is also easily adjustable. It goes up in minutes and one person can put it up easily after learning its quicks. It folds down to a compact size and everything fits into the included carry case that fits in most vehicles. The carrying case has wheels for ease of transport. The E-Z UP Sierra II is another economical and lightweight option ideal for picnics, backyard, parties and more outdoor events. With stakes or weights to hold it in position, it can also withstand the wind at the beach. It is water resistant but not designed to endure prolonged downpours. In spite of being a lightweight canopy, it is well made and sturdy. The canopy fabric meets CPAI-84 fire resistance standards and blocks 99 percent of harmful UV rays. The frame is powder coated steel for durability and corrosion resistance. Ceiling height is another strength this canopy has. The peak height is 8 feet 7 inch and the open cathedral ceiling maximizes the headroom. The legs are also adjustable when setting up in a place with height restrictions. The folding steel frame makes set up and take down quick and easy with two people. Even one person can set it up. The included wheeled bag makes it very easy to tote around. Size: 10’x10′ footprint, 8’x8′ at top. 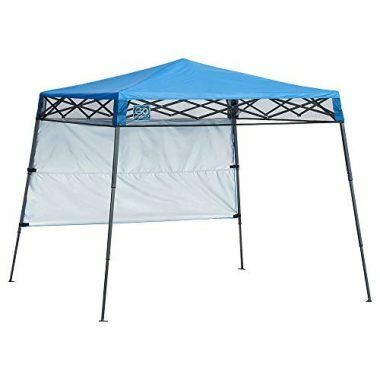 With a mesh screen, 50+ UV sun protection, water resistant canopy with taped seams and roof flaps so it doesn't collect water, this screen tent by Quick Set is what you need to hang out in a bug-infested campground or backyard without worrying about the bugs or the elements. In addition to keeping insects away, the tent provides good shelter from the sun and rain. You can also purchase and attach side panels to block wind, rain, and sun more effectively. As for value for money, this is a high-quality screen tent that's built to last and a top rated canopy tent. The construction, frame, fabric, and zippers are all good quality. The 210 Denier fabric complies with SOR-90-245 fire retardant standards. Sturdy center hubs support extra-large fiberglass poles and together with the hub-style assemblies offer strength and stability. The included stakes and tie-down ropes offer added stability where needed. This is truly an instant shelter that's super easy and fast to set up. You will be able to put it up even on your own. Simply lay it flat, pop out the hubs and push the roof up. For storage and transport, the tent stows well in the included oversize carry bag. The packed size is 72" x 8" x 8". This is a really cool canopy by Coleman. The hexagon shape is unique and nice looking. And because of the vented roof, it is a bit cooler inside this shelter than in other canopy tents. It is also quite spacious - wider and taller than most instant canopies. It is sturdy and very well-made. The canopy is a heavy-duty 150D fabric. It is water resistant and the design prevents water from pooling at the canopy top and causing it to collapse. It is also treated with SPF 50+ UV Guard to block the sun’s harmful rays. The steel frame with thick legs is very sturdy and provides a stable shelter whether you're putting it up on grass, concrete, and asphalt. Staked well, it holds up fine in windy conditions such as at the beach. The venting also helps reduce the effect of wind on the canopy top. It takes a few minutes for 2 people to put it up and is even faster with more people. Its quality and size put it on the heavier side but the carrying bag with sturdy wheels makes it easier to lug around. The slanted legs make this a sleek sun shelter. It is also impressively lightweight and portable making it the perfect portable shade canopy for use on the go. It is really easy to bring it along for short picnics at the park, beach, for sporting events and even when camping. With Aluminex UV protection coating, sewn-in back panel and mesh eaves for airflow, this canopy offers excellent shade and protection when it is sunny. The frame is quite sturdy and powder-coated to resist corrosion. 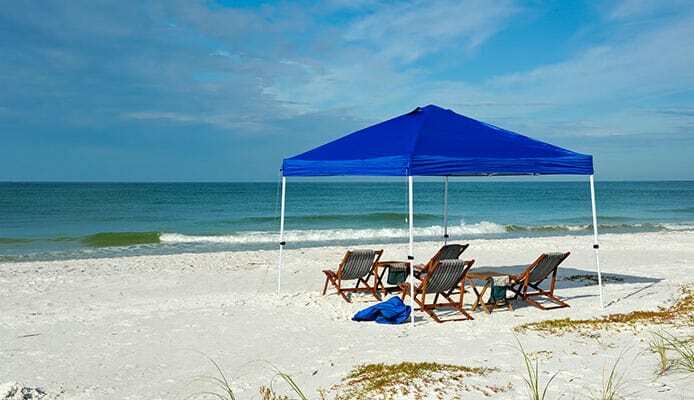 Being a lightweight canopy, it is important to add weight to the feet for more stability if you're setting it up in a windy environment such as at the beach. It is easy to set up and take down and folds down into a compact size that fits in the included backpack. Peak Height: 5 ft. 10 in. 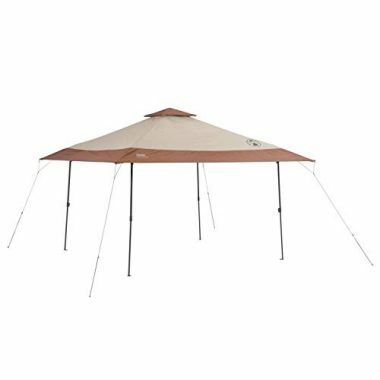 If you want a simple shade canopy that is sturdy and easy to set up, this Expedition canopy from Quick Shade has got you covered. It works great for family outdoor events, tailgating, kids' sporting events, market and vendor events, and more. The fabric is coated with Aluminex to offer UV protection. The easily adjustable height with three different positions makes it a versatile tent. 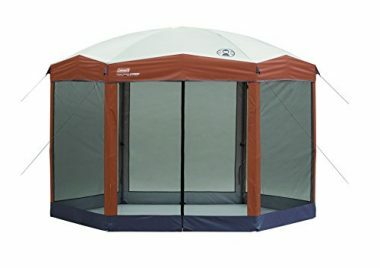 It is also pretty sturdy and durable thanks to the steel frame, hardened thru-bolt assembly, overlapping eaves, and 150D polyester canopy top. The frame is also powder-coated to seal away moisture and prevent rust. It needs staking or weighing down to stay intact in windy conditions. However, it is not meant for use in the rain. It goes up and comes down easily and comes with a carrying case for ease of storage and transportation. Coleman provides great products that make spending time outdoors a pleasure. With an attractive design and built-in LED lighting, this innovative pop up canopy and sun shelter is perfect for picnics, romantic dinners, barbecues, camping trips, backyard hangout, wedding receptions, and enjoying the outdoors any time of day or night. Emitting 400 lumens of light, the integrated lights do a very good job of illuminating the area while adding ambiance and making outdoor occasions even better. It's fully dimmable from dim mood ambiance all the way to very bright task lighting. You can set the lighting just the way you want it. Apart from providing a shady retreat away from the sun, the UV Guard fabric offers 50+ UPF 50+ protection against the sun's harmful rays. The venting allows hot air to escape when it is hot and humid. This pop up canopy is sturdy and stable thanks to the 28mm steel frame and a tough canopy cover. If you need it to withstand stronger wind gusts, you will need to add weights in addition to the guy lines and stakes. You will also need to seal the seams to prevent leakage when it is wet. Because of the single squeeze locks or releases and pinch-free grips setup and takedown is easy and quick but needs at least two people. It is on the large and heavy side but it has telescoping poles and folds down well into the wheeled carry case it comes with making transporting it easier. Center height: 9 feet 4 inches. Following the best pop up canopy reviews, let’s go through how to choose the best canopy tent for your needs. As you can see, pop up canopies generally have a similar setup but no two canopies are exactly the same. They come in all kinds of designs, sizes, materials and have differing features. You need to identify the ideal tent for your intended application. 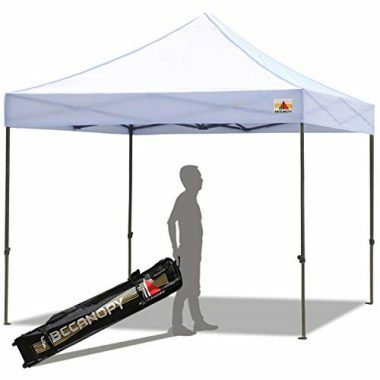 So how do you know what is the best pop up canopy to buy? The first step is to determine your needs. What purpose do you want the canopy to fulfill? What kind of events will you be hosting within its shade? This will determine what type and style of canopy tent will serve you best. When you set out to acquire a pop up canopy, pay attention to the following features so you can understand each canopy’s unique features, find the perfect option for your needs and end up with a good quality canopy that will give you good experiences. The first step is to figure out how much room you will need, how much space you have for the shelter and what tent size will fulfill your needs. Canopy tents come in a wide variety of sizes ranging from five by five feet to ten by twenty feet. There are tents for two, family size tents and larger ones that accommodate large gatherings. 10 ft by 10 ft is the most common pop up canopy tent size and it offers ample room to set a table and seats for relaxing, working, serving, or perusing items. To determine what size you need for your guests, furniture, equipment, and room for movement, find out the amount of space that each person will take up and multiply it with the total number of people that will be in the canopy. Don’t forget to take into account any width or height restrictions if your setup space is limited. Measure the setup area and get a tent whose dimensions will fit. For festivals and fairs, 10 x 10 foot is usually the standard size. For ease of storage and transport, you will also want to check the weight and collapsed size. Pop up canopy tents are generally lightweight and fold up small enough to be carried easily. The two aspects of design to consider are the functionality and the aesthetics. The best design will depend on how you intend to use the canopy, the level of protection and sheltering you need and your personal preference. Most pop up canopies are made up of the frame and canopy top with all four sides open. You can also find canopies designed to offer protection from all kinds of elements. If you need privacy or extra protection from the elements, there are units with detachable side walls that block the rain and wind coming from the sides. Screen canopies have mesh screens all around to keep bugs away. Instant canopies come with either slanted or straight legs. Slanted legs look sleek but take up more space and provide less coverage. Straight legs offer more strength, stability, and height, but are more expensive. When it comes to style, most high-quality popup canopy tents are attractive and elegant. If looks matter to you, ensure you’re pleased with how the canopy is going to look like when set up. The canopy top material is one of the most important factors to consider when choosing a pop up canopy tent. The best canopy material is thick, sturdy and lightweight. Polyester is the most common pop up canopy top material. It is rugged, durable and water-resistant. Its downside is that it is susceptible to disintegration due to damage by prolonged exposure to UV rays. Some manufacturers apply a vinyl cover for UV protection. Vinyl is waterproof, durable, weather resistance, flame resistant, has great UV resistance and is easy to clean. However, this toughness means vinyl canopies are on the heavy side and don’t come cheap. Polyurethane is highly UV-resistance but highly flammable. Polyethylene is lightweight and its durability is decent. The denier is a measure of how thick the fabric is. Canopies can have 150D or 420D while the heaviest and most durable are constructed of higher denier materials such as 600D. You will want something strong enough to withstand the elements and last but still lightweight so that it is easy to carry. Ensure the canopy you order is either waterproof or water resistant so it offers protection in case of a downpour. Most canopy materials such as nylon, polyester, vinyl, and plastic are water resistance. Some tent fabrics have durable water repellant coatings (DWR) so water droplets slide off instead of soaking through. Waterproof pop up canopies have even the seams heat sealed so no moisture can penetrate. Pop up canopy tents come in varying heights and this is a dimension you will want to check so you can end up with a tent high enough that even a tall person can stand inside it without their head touching the ceiling but not too tall that it rubs against trees, buildings, power lines, or other objects. You will need even more vertical space if you’re planning to hang lamps and decor accessories from the ceiling. The frame determines how tall the tent stands. Read the tent specifications or measure the frame to make sure the height is sufficient for your needs. An adjustable height is even better. You can increase the height of the tent so tall people or items can fit inside of the tent and you can use the tent in different settings. You can set the tent high in an open area and lower it if there is a height restriction such as a tree, power line, roof, or building. Understand your sitting room requirements and make sure the canopy you get will meet them. The room you need will depend on the kind of event you’re holding and the seating configuration. It could be a table with a chair visitors can sit on for registrations. A square table with seating on each side for dining. Camping or beach chairs for relaxing or a lecture-hall style arrangement. To determine your sitting room requirement, find out the amount of space that each person will take up and multiply it with the total number of people you will be hosting. You will also need to account for the furnishings and room to sit comfortably and move around. Here are some general guidelines: When hosting a party, allow 10-12 square feet per person. For auditorium events, give each chair 5-6 square feet of space. For concerts, exhibitions, and storage, determine the amount of space the items will occupy and leave some room for movement. The frame is what holds the whole canopy structure together. Picking a tent that has a strong frame that is capable of supporting the tent is essential if you’re to be satisfied with your purchase and if it is to serve you for many years. It is very important to pay attention to the frame material when choosing a pop up canopy. Pop up canopy tents frames are made of either steel or aluminum. Aluminum is lightweight and easy to transport and put up. It is also quite durable and resistant to corrosion. Aluminum frame canopies are light duty and suitable where conditions are calm. It is not strong enough to withstand strong winds or storms. Steel has superior strength, stability, and durability. It is robust enough for heavy-duty use and to keep the tent intact in adverse weather conditions such as rain, snow or wind storms. The downside is that steel framed canopies are heavier and cumbersome to transport and set up. The outdoors can go from calm to stormy without notice. The best pop up canopy tent to buy is one that is strong enough to withstand the elements you’re likely to encounter and hold steady. You do not want your canopy to be blown away by strong winds or the frame collapsed by a heavy downpour. The frame is the backbone of the tent and should be strong enough to support the tent and keep it intact should it rain or get windy. Steel frames are tougher and stronger than aluminum or plastic frames. Canopy strength is also important. There are two categories of canopies. Lightweight canopies are very easy to carry around and set up. However, they are not strong enough to withstand the harshest elements. They are good for sheltering small groups of people such as families, couples and friends when the weather is calm and friendly. Extra weight is needed to keep them intact in case of strong wind. Heavy duty pop up canopies are rugged and built from strong materials that are tough enough to endure extreme weather conditions. They are the ideal canopies for harsh conditions, sheltering large groups of people, for windy beach settings, and for long events. The downside is that these are bulky, heavy and cumbersome to transport and assemble. The canopy frame should also be resistant to corrosion. 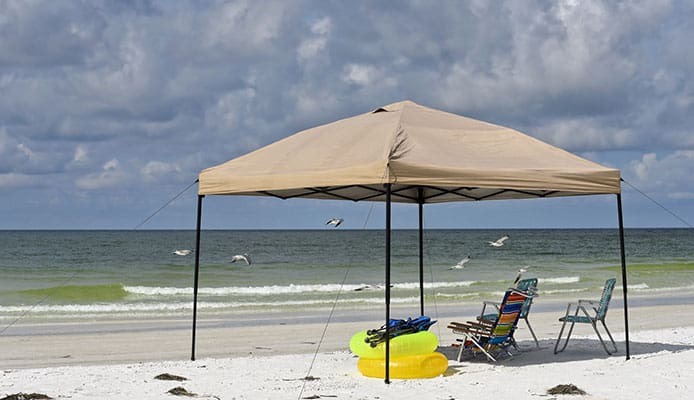 This is especially important for a canopy you will leave exposed to the elements for prolonged durations or use in damp and humid conditions such as with a beach canopy. Aluminum frames are more resistant to corrosion than steel frames. When exposed to corroding elements such as moisture, aluminum forms a protective layer of aluminum oxide that prevents farther corrosion. Stainless steel is better at resisting rust and corrosion than steel. Powder coated frames are even more resistant to rust and corrosion as the coating seals the frames from moisture. User-friendliness is one of the most appealing attributes pop-up canopies have. This is why they are referred to as pop up or instant canopies. The ‘pop up’ functionality makes them easy and quick to assemble. Most of the high-quality popup canopies such as the ones in our pop up canopy reviews are easy to set up and take down. Their frames are designed to collapse and expand easily with just a little pulling and pushing. One or two people can easily and quickly put them up and take them down. There are no complicated steps or special tools or skills required to assemble them. However, the ease of set up differs with each canopy depending on the complexity of the frame. There are some that are easier to set up than others and it is important to read user experiences and go through the setup steps to ensure that you don’t end up with a canopy that will be cumbersome to put up and take down. Once you get your pop up canopy of choice, practice putting it up and taking it down in your backyard. When you’re purchasing a canopy tent, you will want to look at its ease of storage in between uses and when transporting it. Since canopy shelters are designed to collapse into a compact size, they are generally easy to store and carry. Ensure that the tent your order comes with a storage bag that holds the tent and its components in one place. This will make it easy to store and transport the tent. A storage bag equipped with handles and easy gliding wheels is ideal. Check how much storage space it occupies in its folded-down size so you can determine whether it will fit in the allocated storage and transport space. Q: What Is A Canopy Tent? A: A canopy tent is a portable, temporary shelter designed to collapse down to a compact size for ease of transport and go up easily to provide shade.Typically, it is composed of the supporting frame and a top cover called a canopy top. It is usually open on all four sides. It is very user-friendly and installation takes only a couple of minutes. Q: What Are Canopy Tents Used For? A: Versatility is one of the areas where canopy tents shine and they have a wide range of potential uses. There are no limits to their application. Canopy tents are suitable for everything from weddings, beach picnics, backyard barbeques, outdoor parties, dinners, camping trips, speeches, first aid station, yard sales, lemonade stand, tailgating parties, sporting events, festivals and concerts, and business events such as expos and trade shows. You can also use them as protective covers for items such as outdoor furniture, vehicles and swimming pools. Q: What Are The Advantages of A Pop Up Canopy? A: There are plenty of advantages you will be able to enjoy when you own a great pop up canopy. You will love the convenience of having a highly portable shelter you can put up instantly whenever and wherever you need protection from elements such as the sun, wind, rain, snow and even bugs. Lightweight and collapsible, a pop up canopy tent is very easy to bring along no matter where you go. It is also the easiest kind of tent to set-up. One person or two people can set it up and take it down within minutes and without any special tools. It is versatile and will be your go-to for all kinds of outdoor events at home, at the beach, when camping and even when doing business. Apart from offering comfort and relaxation, a pop up canopy has an elegant style, which adds to the aesthetics of your events. All these benefits and they come at affordable prices. The outdoors offers plenty of opportunities to work, relax and have a good time. The only challenge is the unfriendly elements mother nature can present at whim. 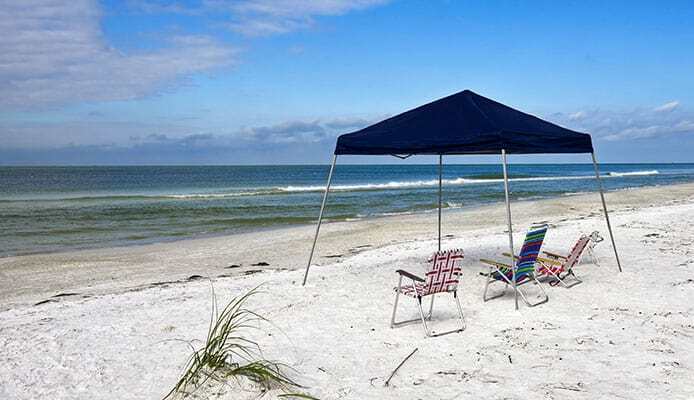 Armed with the best pop up canopy, you have a shady retreat you can put up instantly and have nice experiences outdoors at the beach, in your backyard, at campsites, sporting events, or wherever you need shelter from the sun. Any of the pop up canopies in our pop up canopy reviews will serve you well. Just make sure you pick one that suits your needs and matches your style best. Remember to take good care of the canopy once you have it so you can enjoy its benefits for a long time. Which of the pop up canopy tents on our list is your top choice? We would love to read your thoughts or experience with the instant canopies we’ve reviewed! Feel free to share in the comment box below!